These are all the news posts from the old website, http://www.kristipetersen.net, which was live from April 2006-November 2009. Please note that any links here may not go anywhere; this was moved as-is from the old site. “Charlotte’s Family Tree,” one of the Tales from Haunted Disney World set in—you guessed it—the Swiss Family Robinson Treehouse—is now available in the November issue of A Fly in Amber. You can read it here. It’s really been a banner year for me in terms of acceptances, and I’m happy to close out 2009 on an up note. “Punctuation”—a creepy little tale of ants and semicolons in Key West—has been accepted to ESC! Magazine and will be appearing soon. Also, I plan on completely overhauling and changing my website in the next couple of months. I’ll hopefully have that online by, at the latest, the end of January, though I’m hoping for the end of December! That’s all the news for now! Have a safe and happy turkey day! Here in our house, it’s our favorite holiday…and Nathan and I, this year, got to spend it in Newport, Rhode Island, with some pretty cool people, bonfires, wine, and a book signing! We were at The Annex, a comic book store on Broadway in Newport, where Melissa Martin Ellis signed copies of The Everything Ghost Hunting Book. Nathan was featured in the book, so he signed as well, and he also got the chance to meet some fans of his recent TV special on A&E, Extreme Paranormal. Mark (James Axler) Ellis was also on hand to sign copies of his new graphic novel, Nosferatu: Plague of Terror. Wayne Quakenbush, the store’s owner, did an awesome job. He kept Extreme Paranormal running on the TV all afternoon and provided candy for the visitors and some costumed trick-or-treaters. The entire day was a success and was capped off by a bonfire among friends at the Ellis’. It was the most magical Halloween we’ve had in a long, long time! To purchase The Everything Ghost Hunting Book, click here. To purchase Nosferatu: Plague of Terror, click here. “Romancing the Goat”–one of the Walt Disney Park-set ghost stories—has now been published in The Oddville Press! Check out this story of sibling rivalry gone wild in Volume 1, Issue 5. Visit http://www.theoddvillepress.com and check them out. I’m pleased to announce that “Charlotte’s Family Tree,” another of the Disney Parks ghost stories which centers around—you guessed it—the Swiss Family Treehouse!—has been accepted to A Fly in Amber and will appear in an upcoming issue! I’ll keep you posted. I’ll keep you posted as these stories become available! Not facing your past has its pitfalls: “Miss Reyna Gets Her Comeuppance on Flash Mountain (A Lost Ghost Tale of Uncle Remus)”—part of the Admit One Literary Theme Park collection of Disney Park Fan Fiction—is now available in Issue 2 of Scalped. To read the story for free, click here. I’m pleased to announce that I’ve been awarded a two-week residency at the Norman Mailer Writers Colony in Provincetown, Massachusetts through the Norman Mailer Fellowship & Residency Program. In January of 2010, I’ll be staying in a one-bedroom condo across the street from Mailer’s residence, where his library has been left exactly the way it was when he passed away in 2007. I’ll have access to his library – and two whole weeks in peace and quiet to devote to my writing. If you’d like more information about the Norman Mailer Fellowship program, click here. “Ghost Light,” the post-apocalyptic ghost tale that originally appeared in Barbaric Yawp‘s December 2006 issue, is back in print in Morpheus Tales‘ Undead Special Issue. Here is a PDF preview of the issue. Want to read the whole thing? Support the small mags of the world and head on over to www.morpheustales.com to order. 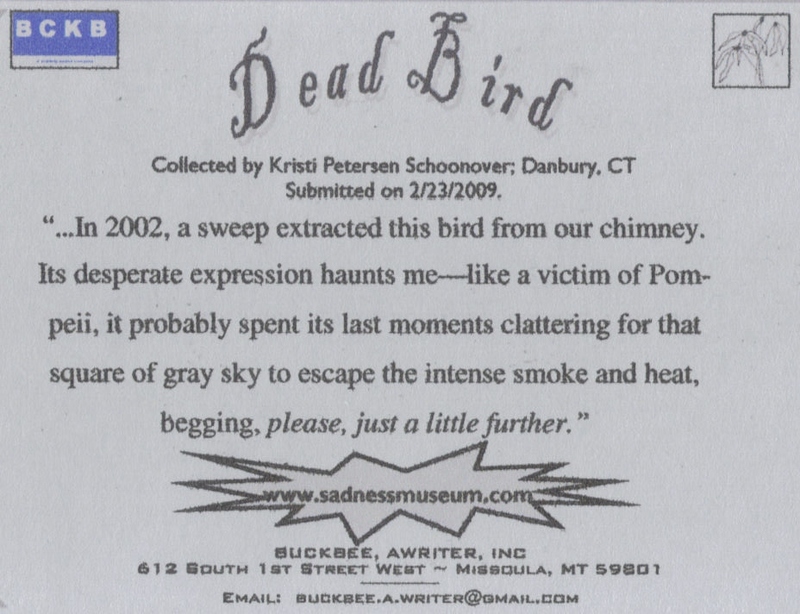 The Sadness Museum is a unique collection of “sad” objects which travels the country. 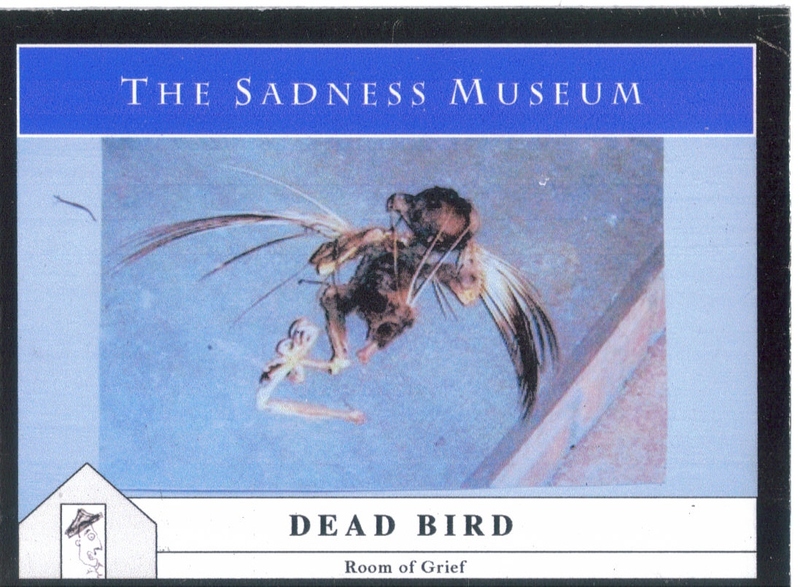 I’m proud to announce that the photo of the bird that died in my chimney back in 2002 (don’t ask) is now at home in the museum’s “Room of Grief” and is featured on some really cool trading cards (see photos below). For more information on the museum and its unique mission, head on over to The Sadness Museum. If any of you have broken, moldy children’s toys, this is the place to send them! Macabre Cadaver has just published my short story “Synecdoche” in its July/August 2009 issue. For some reason, I’m credited as Petersen Schoonover—not a bad name, actually. Very Remington Steele. Anyway, you can visit www.macabrecadaver.com to read the piece. Macabre Cadaver will feature “Synecdoche” in an upcoming issue – publication date to be announced. Microhorror ran “Right Where Mother Left It” in its December 10, 2008 issue. For some reason, I forgot to post this earlier (well, it was the holidays). You can head on over and enjoy that here. Nathan will be featured in Melissa Martin Ellis’ The Everything Ghost Hunting Book, which will be available for purchase in August. We had an enormously successful book signing and reading for the Walls & Bridges Anthology this past Saturday, April 25, at Books on the Square in Providence, RI. Thanks to Mark and Melissa Ellis for putting together such a fine book! I was privileged to share the dossier with E. Bell Carroll, Jessica Grota, Amy Machado, Gil Paradis, Richard Alan Scott, Heather Sullivan, John Michael Skaggs, and Susan West Kurz. And as someone who has held groups and readings at many bookstores, I’d like to add the note here that Chris and the gang at Books on the Square were the most gracious hosts thus far. Morpheus Tales will feature “Ghost Light,” a post-apocalyptic ghost story, in its upcoming Special Undead Issue. “Ghost Light” was originally published in the December 2006 issue of Barbaric Yawp. You can check out Morpheus Tales—a great print ‘zine out of the UK—here. My urban legend/ghost story “Bridging Christmas,” which placed 3rd in Toasted Cheese‘s 2008 Dead of Winter Contest, is posted in their March issue. You can check it out here. Great news to kick off my birthday month! I’m pleased to announce that my story “Bridging Christmas” just placed 3rd in Toasted Cheese‘s 2008 Dead of Winter Contest! This is the third year in a row I’ve placed—“Wailing Station” took 2nd in 2006 and “King of Bull” took 1st in 2007. The contest is blind-judged, and this year’s themes were “Blood River Bridge”, “Alternative Santa”, “Ventriloquist”, or “Alaska”—or any combination thereof. The piece will be published in the magazine’s March issue. More information here. 1. Walls & Bridges Anthology Book Signing Saturday, December 6. The whole cast of talented writers and artists who were published in Millennial Concepts’ Newport Round Table Anthology Walls & Bridges, under the editorship of Mark and Melissa Martin Ellis, will be on hand Saturday, Dec. 6, from 6:30 – 9 p.m. at Empire Tea in Newport, RI. We’ll sign books, read, and celebrate! I’m honored that “Crossing Guards” shares the Table of Contents with so many great pieces of work. It’s also the first time my friend Heather Sullivan and I are in the same publication! If you happen to be in town, come on by and say hello. If you wish to purchase the anthology, you can head to The Newport Round Table or Amazon.com. 2. “Down in the Green” in Crimson Highway: Dark Romantic Fiction. The story appeared in its October issue. 3. “Confetti” Parts I & II in All Things Girl. They divided the story into two parts. You can read Part 1 in the November issue by clicking here. Part 2 is in the December issue; you can read that here. 4. New England Horror Writers. I joined New England Horror Writers, joining many other talented writers and friends like L.L. Soares, Morven Westfield, Lon Prater and Jody L. Campbell. You can read more about them at http://www.horror.org/ne/. 5. I’m happy to report that for the 5th year in a row I’ve hit the 50,000 word mark in National Novel Writing Month. This year, I didn’t do a novel—I instead wrote brand-new material for Admit One Literary Theme Park. I now have an inventory of nine new stories to send out. Some will be included in my hard-bound thesis, What the Dormouse Knows; the rest, as of now, will go into the (eventual) hard-bound collection Digging Dirt in River Country. And I’ve got six more stories in my brain just waiting to be put on paper. While I’m at it, congratulations to CJ, our fearless ML for the brand new Fairfield County region. We are small but mighty. I’m already looking forward to participating next year! It’s that time of year again! Get out your AlphaSmart NEOs or your laptop, head to the nearest coffee shop, and get Nano-ing! Remember that although Fall is descending and the leaves are dying, October is also a month of blessings—get out that catnip for good luck! Anyway, these past couple of months have been so full of blessings that here, I’ll just be brief. Wrong World®‘s multi-media anthology (PDF and DVD) I’m Going to Tell You One More Time, which features my short story “Wailing Station”, is now available. It’s a true pleasure to be featured among 23 other fantastic, well-known horror writers—many of which are my favorites: Sara Joan Berniker, Mort Castle, Ralan Conley, O’Neil De Noux, JG Faherty, Bruce Golden, John Grover, Jane Gwaltney, Brian A. Hopkins, Michael Kelly, Michael Keyton, John Kuhn, Barton Paul Levenson, Norma Jean Lipert, William Meikle, Scott Nicholson, Maria E. Schneider, Jacqueline Seewald, Martin R. Soderstrom, J.J. Steinfeld, Bev Vincent, Kaaron Warren, and Donald P. Willard. Each of us was asked to record a special Halloween audio message, featured on the DVD. Don’t miss out: get Scary Short Stories for Halloween! Crimson Highway’s October 2008 Issue features “Down in the Green” as one of the four it chose for this month. You won’t ever set your feet in murky waters again! Admit One Literary Theme Park is now open! 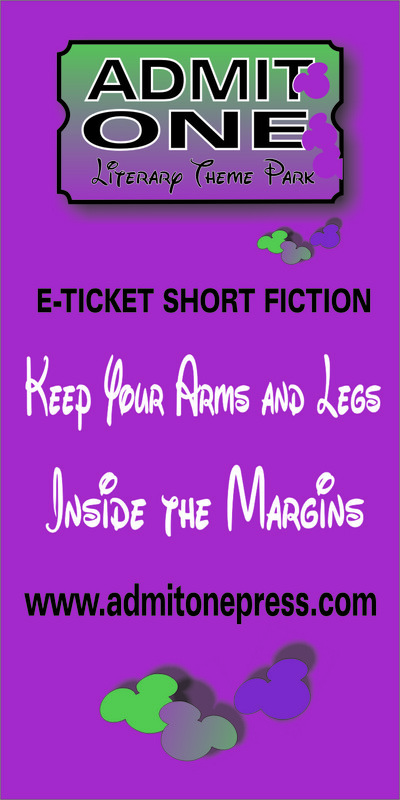 Head on over to enjoy E-Ticket Short Fiction for Grown-Up Disney Fans. This month’s feature, “Miss Reyna Gets Her Comeuppance on Flash Mountain”, will be posted soon. Dead Letters‘ new feature, “The Sweet Perils of Isolation”, aired September 21 and highlights Jeanne Mackin’s book, The Sweet By and By, about the Fox Sisters. Full text of episode. Hope your summer’s better than it’s been here in Connecticut…much too cold, too much rain. But lots of good news this month! My short story “Crossing Guards” was picked up by The Newport Round Table‘s Walls & Bridges Anthology, due out later this year. I’m especially honored to be included in this collection. Not only is it edited by Mark and Melissa Martin Ellis (talented, widely published writers and artists and really cool people), but my friend Heather and I have been friends for 15 years, and this is the first time we’ll be featured in the same Table of Contents! Her poems “Driving Home” and “One Patch of Earth” will be in the anthology as well. I should have purchasing information within the next few months. “Wailing Station”—which took 2nd place in Toasted Cheese’s 2006 Dead of Winter Contest—has been purchased by Wrong World® for inclusion in their sixth multi-media collection, entitled I’m Going to Tell You One More Time. The story, along with many others on the same theme, will be published in DVD, video, and PDF format. It will be available for purchase and rental on October 1. Admit One Literary Theme Park‘s website will be up and running on September 1. Ads will appear on the Orlando Attractions Magazine website on the same day, and in their print editions beginning with the October/November issue. Want to see the ad that LOKI Graphics designed for the print magazine? Check it out—here’s a TINY version of it, below. You can still sign up to get stories once a month in your inbox. Remember to keep your arms and legs inside the margins! On a related note, artist Melissa Duckworth of Pandora Ink Designs, Inc.—which is publishing an altered book version of “Candle Garden”—has expressed interest in publishing a collection of the Admit One stories when they’re ready. She’s a fantastic artist and already has some great ideas. Visit the Pandora Ink Designs’ beautiful new website at www.pandoraink.com. In fact, if you’re a writer, check out their submission guidelines under the Upcoming Projects tab. If you’re looking for unique gifts, explore their store. You already know that “Deconstructing Fireflies” appears in the Beacons of Tomorrow: Second Collection. The other day I found it—and our names—on someone’s blog! It’s nice to know you’re being talked about! It’s under the August 9, 2008 entry entitled “Auburn Good ‘ol Days”. In addition, Nathan and I just put together a really great radio commercial which will air on The Ghostman & Demon Hunter Show. Pencils! Writing Workshop celebrated its 5th anniversary on July 26! We held a wonderful Soiree in Wonderland. That’s all for this month…and now, I’m going to Disney World! (Yes, for real; I leave on August 21st). 1. BEACONS OF TOMORROW: SECOND COLLECTION: Nathan and I are proud to announce that Tyrannosaurus Press’ second science fiction anthology, featuring our story “Deconstructing Fireflies”, is now available for purchase! Support Bret Funk and his amazing small press. Purchase a copy at the special price of $8 at Tyrannosaurus Press, or check it out on Amazon.com. 2. I wasn’t expecting this one—on May 25, I was appointed Editor-in-Chief of Goddard College’s literary journal, PITKIN REVIEW! It’s been a hectic couple of months working with the staff and putting measures in place to get the Fall 2008 issue up and running. If I’ve not responded to your e-mails and phone calls…well, this is probably why! Needless to say, I’m thrilled about this amazing opportunity. And I’m proud to brag that I’ve got the most talented, enthusiastic staff I could have ever asked for—we’re gonna make this issue sing! Stay tuned for updates…I will be taking pre-orders for anyone outside the school who’d like to purchase a copy. 3. ADMIT ONE LITERARY THEME PARK. I was a Disney fiction fan who wanted more. I met other Disney fiction fans who wanted more. So I started writing short stories set in Disney Parks and e-mailing them in PDF form to Disney fiction fans who wanted more. And now I’m pleased to announce that Admit One Literary Theme Park is on the cusp of its opening day! The website, which will feature PDFs of the stories that have gone out so far, and many new ones in the coming months, will be up and running sometime between August 15 and September 1. All of the site’s content will be FREE and distributed under the Creative Commons License. At the moment, I’m considering two options: guests can visit the site once a month or elect to have the stories e-mailed. Being that Admit One is an extension of my graduate thesis, What the Dormouse Knows, some of the stories may be works-in-progress and subject to additional polish. Print and web ads will hit Orlando Attractions Magazine beginning with the September issue. I couldn’t have made it this far without the team of people who have provided feedback and given their time to work on this project. Jonathan Sullivan of LOKI Graphics designed our logo; Rob Mayette is working on our website; Jerry Rivard, Heather Sullivan, Rob Mayette and YoungJames Kenny, all fine writers, provided initial feedback on the story drafts; Richard Merskin at Orlando Attractions has been patient and encouraging. And, of course, there are the countless readers from the Inside the Magic forums—the Disney fiction fans who wanted more—who read the stories and gave me their input. I’ll keep you posted, but get ready to vacation in the park soon! 4. PENCILS! WRITING WORKSHOP, based in Norwalk, Connecticut, will celebrate its 5th Anniversary this month. I raise a toast to a very talented, diverse, and dedicated community of writers who have hung in there as a family for five years. Wow. Here’s to another five years of rejection slip burnings, savvy critique, growing membership, field trips, parties, and innovative educational opportunities. 5. DEAD LETTERS—my monthly segment on Nathan’s The Ghostman & Demon Hunter Show—hit the airwaves with “Creative Crypto” on May 11! Although June and July haven’t made it up yet (June was a bit crazy), those episodes have been recorded and a third is in the works. I’ll announce them when they’re released! Check out the full text of Creative Crypto or listen to the show’s May 11, 2008 episode in the G&D archives. That’s all for now. I have many stories floating around out there, and I hope to report more acceptances soon. 1. A photo of my brother Chuck and I, as well as a blurb about the extinct Bob-A-Long boats at Disney’s Polynesian (then-Village) Resort, appears in the April/May 2008 edition (Issue 3) of Orlando Attractions Magazine. The photo was taken in 1977, and thanks to the fact that it was good old-fashioned Kodak slide film, looks as though it was taken yesterday. Don’t miss this trip down memory lane! If you’re interested in ordering the issue, just visit their website. You can flip through the magazine for a free preview or order directly from that page. 2. “Deconstructing Fireflies”, which was written by Nathan and I back in 2005 and was previously published in The Illuminata, is due out in the Beacons of Tomorrow II anthology, published by Tyrannosaurus Press, on July 1 of this year. 3. All Things Girl has picked up my short story “Confetti”—all about paper dresses, a pissed off girl and a couple of matches—for its November and December issues; it will serialize the piece. ATG is an e-zine that launched in 2001, and their mission is to, as noted on their website (I don’t want to plagiarize here, but they really put it best, so these are their words, not mine): “give women a place to showcase their stuff – their artwork, photography, poetry, prose, articles on health, reviews, thoughts on business, creative endeavours and so much more.” Curious? Explore ATG …and stop back there in November and December to take in “Confetti”. I’m pleased to announce that Pandora Ink Books will publish a limited edition, perfect-bound pressing of my short story, “Candle Garden”—a haunting story about a woman struggling with the loss of her children whose tryst with a wax artist leads to some…well, interesting outcomes. Melissa Duckworth is a talented artist who carefully selects poetry and short fiction which inspires her; then she creates a three-dimensional book-art experience. “Candle Garden”, with a limited edition of 50 copies (that’s gotta make you feel famous, folks!—I’m good enough for limited edition?? ), will be a reproduction of the work she created around this story for an art installation; she acquired the rights to this story a couple of years ago, and she has invested much time in turning my story into a work of art. Copies will run at $30.00 and the book is slated for release in September 2009; pre-orders are being taken now. Although 9/09 seems a long way off, her books are popular and many sell out in their pre-order phase. Support the small press! Her work is amazing and you won’t be disappointed, I can promise you that. For information and for a link to order, please visit her myspace, or contact me and I’ll direct you to her online catalog, which not only features the release of my book but several other wonderful projects as well (hint: start your Christmas shopping early)! I’ll probably be keeping this at the bottom of my monthly newsletter for awhile, so you don’t have to save this e-mail. 2. It was nice to see that my story, “King of Bull”, was mentioned on at least one other website, Technorati.com. Although it’s just that my name appears in an entry, if this person has lots of readers, then those readers may go and check me out! 1. “King of Bull”, which took 1st Place in Toasted Cheese’s 2007 Dead of Winter Contest, is now available to read in their March Issue. This year’s topic was “Urban Legends”. I encourage you to not only read King of Bull, but other stories in all over their archived issues. It’s a great magazine. To check out the other issues, go to Toasted Cheese. 2. “How I Learned to Stop Complaining and Love the Bunny”, which was first published in Citizen Culture Magazine back in 2005, has been picked up and is available for purchase at AnthologyBuilder.com. Anthology Builder is a great new concept that’s doing very well: they have tons of previously sold short stories on a wide variety of subjects. You can register, browse in a number of ways, select up to 300 pages of fiction, a customized cover and title, and purchase. It costs around $15, and the authors make small royalties on every story of theirs that’s sold. This is really a lot of fun, there’s quality material, and it makes a great gift—or, for people like me who are picky, makes it easy to put together an anthology of nothing but stories I like. Consider putting together your own anthology (and include my story!) Head on over to AnthologyBuilder. 3. Dead Letters—my monthly segment on Nathan’s The Ghostman & Demon Hunter Show which had been on hiatus for the past six months because I wanted to re-tool its vision—is back on track! Now it’s paranormal short fiction picks, and this month I recommend 4 goodies incorporating Urban Legends. You can investigate the March episode at http://www.ghostanddemon.com and hit the archives for the Sunday, March 9 show—or just take a short cut to what I’ve recommended at The Ghostman & Demon Hunter Show forums under the Dead Letters section. I’m PLEASED to report that my story, “King of Bull”, took first place in the Toasted Cheese 2007 Dead of Winter Contest! The last time I won first place in a short story contest, she was 12. Perseverance pays off! This was the second story she wrote for the contest—the first one was “Crossing Guards,” which I didn’t submit because it made a disappointing show at the Pencils! meeting on November 27. So I came up with this second idea. The story will be published in Toasted Cheese‘s March issue. Toasted Cheese is a great mag; check it out at www.toasted-cheese.com. “Wailing Station” has been honored once again–this time, it’s been accepted to the podcast-based magazine Parade of Phantoms! Great stuff, scary stories all worth a listen. “Wailing Station” will be broadcast in a future episode. “Glass Kill” appeared in Goddard College’s journal The Pitkin Review, Spring 2008 issue. Now, here’s something interesting: the editor sent me a note assuming that the word I’d used in the story, “chourico”, was misspelled, and shouldn’t it be “chorizo”? I wrote back and said, “no, the story is set in Fall River, Mass., where “chourico”, because of the area’s Portuguese influence, is spelled this way. “Chorizo” is the Spanish spelling.” In fact, the meats are, indeed, prepared differently, so they don’t even taste the same. Despite all of this, the magazine prints—you guessed it—“chorizo”! Jeez, sometimes you just can’t win. My father, Charles W. Petersen, passed away on January 2. He didn’t exactly love the things I wrote, but he was a writer himself who had a great love of literature. His favorite poet was Robert Frost. Dad is the man who inspired me to be what I am today. If you’d like to read the eulogy I gave today, it’s posted at the bottom of the page: Nothing Gold Can Stay: In Memory of Charles W. Petersen. My story “Matchbox” is in The Taj Mahal Review‘s December, 2007 issue. The anthology-style publication is based in India. Curious? You can check it out here. In addition, a photo and brief tip about a great place to see Epcot’s Illuminations fireworks appears in Issue 1 of Orlando Attractions magazine. The magazine is affiliated with the Inside the Magic Disney-related podcast. Check out this great new publication here. Kristi is working on Mourning After, her NaNoWriMo Project for 2007. As of today at noon, she’s hovering at 16, 972 words since starting on Thursday. “Bad Enough” is now available in the I Am This Meat anthology…congratulations also to all the other fine writers is this incredibly unique collection. The anthology is FREE and is available to read on the web or in downloadable PDF format (recommended–you don’t want to miss the stunning artwork and layout on this one). Soon it will also be available as an audio download. Check it out here. Kristi’s short story “Bad Enough” will be appearing in Susurrus Press’ anthology I Am This Meat, and “Deconstructing Fireflies” will be appearing in an anthology from Tyrannosaurus Press. Watch this spot for more details! Get on out there and sign up for National Novel Writing Month (NaNoWriMo)! Join the ranks of thousands of us crazy loons who turn out 50,000 words in just 30 days. For more details and to register (it’s FREE! ), head out to www.nanowrimo.org. I’ll serve as a fiction editor with several of my peers, including experimental writer Meghan Guidry, on The Pitkin Review, Goddard College’s literary magazine. To check out the magazine and order a copy, visit http://web.goddard.edu/pitkin/. I’ve been accepted to the MFA in Creative Writing program at Goddard College in Plainfield, Vermont; she begins study on June 24. To read more about Goddard and its programs, visit http://www.goddard.edu. Many people asked to read or have a copy of the speech I gave at Burlington College’s Commencement. You can find the text by clicking the link at the bottom of this page. The Taj Mahal Review, out of India, has published my story, “Candle Garden,” in its June, 2007 edition. To purchase a copy (this is not an online venture), please visit The Taj Mahal Review. I’ve been named a speaker at Burlington College’s 2007 Commencement, slated for Saturday, May 19, 2007, in Burlington, Vermont. I plan to speak on the global benefits of being true to your own passions. For more information about Burlington College and its fantastic Creative Writing program, click here. I’ll be speaking at CAPA-U Saturday, May 12, 2007, at the Steamboiler in Hartford, Connecticut. The event, which is a day of informative writing workshops and fifteen-minute meetings with agents, is sponsored by the Connecticut Authors and Publishers Association. I’ll present a one-hour lecture on “RX for a Healthy Plot.” This year’s conference is sold out, but for more information on CAPA or to watch for details on the 2008 program next May, check out http://www.aboutcapa.com. I’ve officially joined the crew of The Ghostman & Demon Hunter Show with a monthly segment called “Dead Letters: The Last Word in Paranormal Literature.” Check out the popular Ghostman & Demon Hunter Show–aired live on Sundays at 9 p.m. or available in archives–at http://www.ghostanddemon.com. I’ll be with the guys at the GhostWorld Conference in Gettysburg July 20-22, 2007! My story “Wisdom” (entitled “Teeth Wisdom” by the editors) is now online at Bewildering Stories in Issue #238! Read it here. “Wailing Station” is now available on the web! You can read it here in Toasted Cheese‘s March 2007 Issue. Please be sure to check out the entire issue! It’s fantastic writing! My story “Ghost Light” was discussed on author William Michaelian’s website. To read the conversation between the author and Barbaric Yawp editor John Berbrich, click here! My latest piece, “Wailing Station,” has placed 2nd in the Toasted Cheese 5th Annual “Dead of Winter” Contest! The story will appear in the mag’s March issue. “Camping,” is now in the December, 2006 Issue 10 of Chick Flicks! “Deconstructing Fireflies” (co-authored with Nathan D. Schoonover) is now in the Dec. 2006 issue of The Illuminata. Read it here! “House Sitter” is now in the November 2006 issue of Purpleverse! “Ghost Light,” which was picked up by Barbaric Yawp, does not have a place on the web for posting; it’s strictly print. However, you can visit BoneWorld Publishing here for more information and to subscribe! NanoWrimo–National Novel Writing Month–has come to a close and this year was extremely exciting. I topped out at a little over 112,000 words. Special congratulations go to all of my other friends who were winners! Andrew Watts, you’re the bomb; John P, rock on; Nanette, wow, you pulled that one off quick; and Tifani…YOU GO GIRL!! I knew you could do it. I have just started my own magazine based on the idea that my work, as many of you know, just doesn’t fit in a genre. Torchlight Tales will be arriving in mailboxes everywhere in the beginning of January! I’ve now completed the 22 short stories required for my new collection. Details coming soon. I met a new friend, artist Melissa Duckworth, on urbis.com. Melissa expressed interest in taking my story, “Candle Garden”—still being edited—and turning it into book art. Melissa was a highly successful editor of the award-winning journal Cellar Roots in Michigan. My story “Bird Letters” received “Commended” in the Winning Writers Tom Howard/John Reid Short Story Contest. If you are interested in seeing my April appearance on Brian Jud’s The Book Authority, contact me for a copy on videocassette. I discussed my writing journey and gave some tips, and also discovered that it’s really true that you look anywhere between 10 to 20 pounds heavier on television. I am still searching for an agent for Bad Apple. I now hold a BFA in Creative Writing and Literature through Burlington College’s legendary Independent Degree Program! If you would like information on this unique and fulfilling way to finish your writing degree, be sure to visit http://www.burlington.edu/pages/academics/idp/idp.html. And yes, that’s me in the background, taking in coffee and a book with my poet-friend Tara at the Church Street Borders. [Update 11/09: Burlington College now has a new website. You can find that here…but the photo of me is no longer there]. On this [refers to former www.kristipetersen.net] site, I’ve taken down the “Pocket Paragraphs” feature. I’m eventually going to serialize one of my novels there instead, for no reason at all, really, just because I thought it would be fun.